This is a copy of a publication in Frontline Security, 8(2), pp. 12-14, Fall 2013. Also available online from the publisher and in pdf format. Please cite as: Deflem, Mathieu. 2013. 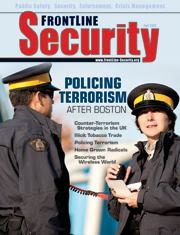 “Policing Terrorism After Boston.” Frontline Security 8(2):12-14. The policing of terrorism involving the practices initiated by criminal law enforcement agencies in the fight against terrorism, both at home and abroad, has been a traditionally neglected area of investigation among scholars, policy analysts, and the general audience alike. This situation has not changed substantially since the terrorist attacks of September 11, 2001, despite the fact that police organizations have since then been even more involved in counterterrorism than they had been in the years and decades prior to the worst terrorist incident to hit the United States. This relative neglect of the police dimension of counterterrorism, however, was suddenly and rather dramatically altered more recently, specifically on April 19, 2013, when American television audiences and, by implication of today's global spread of internet-based communications technologies, people across the world could live witness the work done by police and security officers of multiple agencies in pursuit of one of the perpetrators of the Boston Marathon bombings. That night, many of us were glued to our TV sets and hand-held or desktop electronic devices to witness a very real impact of the rather enormous counterterrorism apparatus that is now at the disposal of the security and law enforcement community. The sudden and fairly intense popular acknowledgment of the police role in counterterrorism in the Boston case needs to be placed more broadly in the context of the patterns and dynamics of counterterrorism policing over the past years, so that the public at large as well as students and scholars of relevant policies will fully appreciate the role of police institutions in fighting terrorism. Globally, the policing of terrorism is an uneven phenomenon that has been affected by various factors related to both police organization, on the one hand, and crime and terrorism, on the other (see Deflem 2010). It goes without saying that the policing of terrorism is affected by the occurrence of terrorist incidents and the relatively stable or, conversely, sporadic presence of terrorism in different national contexts. Police and security forces in countries where terrorism is of long-standing concern have a more developed history of developing counterterrorism capabilities than police in countries that have largely been spared from terrorist attacks. By that logic, it can be observed that police and intelligence agencies in many European nations already expanded their counterterrorism role during the 1970s, when several politically motivated terrorist groups were active on the continent, rather than in the United States, where the homeland has long been free from activities described as terrorist. U.S. involvement in counterterrorism was initially more affected by developments abroad, specifically attacks perpetrated against Americans and/or oriented at American interests on foreign soil. Traditionally, indeed, terrorism was in the United States perceived as a foreign problem. The situation of counterterrorism policing in the United States altered primarily under influence of two events. First, the Oklahoma City bombing of April 19, 1995 showed that terrorism can also hit at home, even in the heartland of America, and can be perpetrated, even more shockingly, by a U.S. citizen for reasons distinctly related to the American context. Second, the events of 9/11 like no other incident before and since and, even more remarkably, like no other incident anywhere else in the world has shaped counterterrorism policing since, in the U.S. as well as in many other parts of the world. September 11 was and remains the major catalyst of counterterrorism policing, a function which has been expanded and intensified greatly following those tragic events. It must be carefully noted, however, that 9/11 is not to be seen as a singular moment but instead must be viewed as one instance in a broader pattern of development, because police and other security agencies had already begun to develop counterterrorism practices well before the fall of 2001. And more remarkably still is that the elaboration of counterterrorism policing since September 11 is completely in line with the developments that had already been set in during preceding years and decades on the basis of acquired police expertise and professionalization. These principles of professional policing relate to both the means and the objectives of counterterrorism that police agencies develop and enact. With respect to the means of counterterrorism, police institutions rely on the central principle to employ to the most efficient methods to fight terrorism. The emphasis on efficiency standards is reflected in the premium that is played on technological advances in fighting terrorist groups and individuals, such as swift and direct methods of information exchange among police agencies of different jurisdictions, both domestically as well as across national borders. Further considered instrumental for effective counterterrorism policing are systems of cooperation among police and related security agencies that are rooted in the informal networks that exist among police rather than any legal regulations or formal policies established by governments (Bayer 2010). Additionally important are various technologically advanced instruments of crime detection in counterterrorist investigations, ranging from the tracking of cell phone communications and the uncovering of money-laundering schemes to the use of officers with special linguistic and other culturally appropriate skills of human intelligence who can complement machine-based technologies. With respect to the objectives of counterterrorism, it is most important that police agencies define terrorism as a crime and approach terrorists as criminal suspects. Thus, terrorism is de-politicized, despite the often political and/or more broadly ideological motives associated with terrorist acts, on the basis of an understanding of terrorism that is not necessarily linked to national security interests. Instead, terrorism is defined by police as a criminal act that, irrespective of the motives of the perpetrators, involves the illegitimate use of violence and other acts punishable by criminal law. As a result, terrorism can for police be both domestic or foreign in nature, and attention from police agencies indeed goes to both of these forms of terrorism, irrespective of the relative difference in emphasis that can typically be observed between them at the political level of governments. Importantly, the view of terrorism as a crime leads police agencies to not view of their counterterrorism activities in terms of a 'war on terror', in the strictest sense of the term, as police have no role in warfare, which is a function delegated to military forces. Unlike soldiers engaged in war with the obligation to kill or capture enemies, police officers conceive of terrorists as criminal suspects that have to be arrested and brought to trial for a determination of guilt or innocence. Strikingly, the lines between the war on terror as a military function and counterterrorism as a civilian task has in recent years often been blurred. The delicate situations posed in certain contexts, such as in the case of the apprehended terrorists held at Guantanamo Bay and, on a more permanent basis, in post-invasion Iraq and Afghanistan, has placed a special burden on the military to take on police duties while also pressuring civilian police to adopt a quasi-military role. The spectacular chase of the suspects of the Boston Marathon bombings made visible, almost literally for all of the world to see, how important the role is of criminal law enforcement agencies in the fight against terrorism. That high-profile event, arguably the most prolific on U.S. soil since the events of 9/11, especially brought out the centrality of cooperation among various security agencies at the local, state, and federal level as well as among functionally specialized organizations such as police, fire-fighters, medical teams, and other emergency responders. The Boston events sadly also revealed the very real dangers that are involved in counterterrorism policing, most distinctly so when an officer of the MIT university police was killed by one of the perpetrators of the bombings. What the Boston events hopefully also will bring about is an increasing and more lasting awareness of the important role of police agencies in counterterrorism. For it must be clear, especially now that the war in Iraq has ended and the U.S. involvement in the invasion of Afghanistan is nearing its end, that terrorism is a problem that must be expected to continue to remain present in our increasingly global age. To the extent that at least the risk of terrorism is a concern affecting multiple nations today and tomorrow, the role of a permanent force of police in securing citizens from harm of terrorism must be recognized, understood, and appreciated more than ever before. Bayer, Michael D. 2010. The Blue Planet: Informal International Police Networks and National Intelligence. Washington, DC: NDIC press. Deflem, Mathieu. 2010. The Policing of Terrorism: Organizational and Global Perspectives. New York: Routledge.